Step 1: What's the Quality of Your Forage? 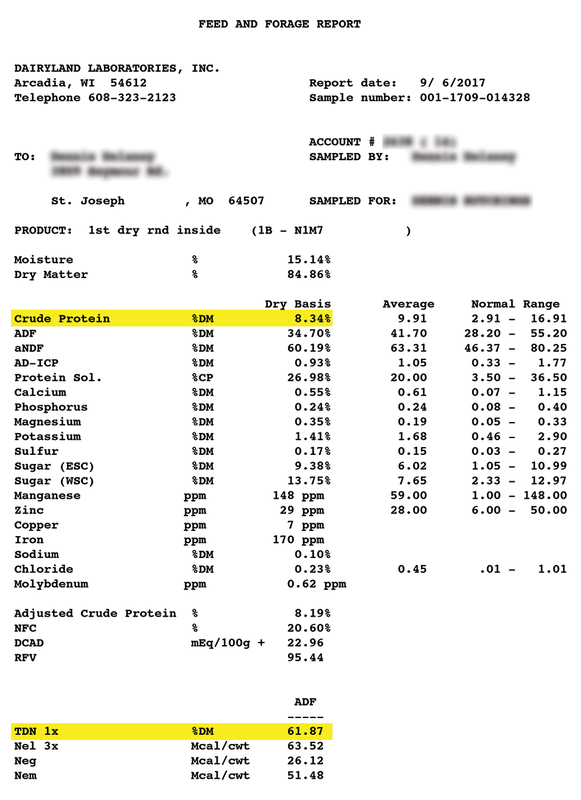 Step 2: What are my forage test results telling me? What Products Work For You? There are two ways you can take hay samples: with a hay probe or by hand. Regardless of the technique used, the sample should be representative of the entire lot. This means that you should sub-sample around 10% of the total bales in the lot from a minimum of 10 corings and/or hand grabs. Sampling with hay probe: Reach as far as possible inside the bale with your coring tool. This can be more difficult when bales are wet or when the hay is very mature. In those cases, a spare battery for the drill is helpful especially if a large number of bales are to be probed. To obtain a complete nutrient analysis, VitaFerm customers planning to use VitaFerm in their ration can contact their local dealer about hay testing. Dairyland Laboratories, Inc., completes lab analysis and results will be emailed to the producer, dealer and ASM. Knowing the nutrient value of your hay can increase performance and save you money. With that in mind, VitaFerm is excited to offer this new tool to help you make an educated decision on when you should supplement with protein and/or energy to achieve maximum performance goals. First, you will need to take hay samples. For information on how to take and submit please follow this link. After you receive your hay analysis back from the lab, enter the values for protein and energy of your hay and the month you began calving and hit "calculate". The bar chart will then be populated to show the protein and energy needs for your herd relative to when you calve. Example lab analysis for samples tested through VitaFerm. If you have questions about where to find your data please contact our team. Using the Nutrient Requirements of Beef Cattle from NRC, we are able to calculate the percentage of protein and energy your hay is currently providing vs the recommended amount for optimal performance. We then use that data to create a guideline that shows what months since calving you should supplement with protein and/or energy to achieve maximum performance goals. At any time your graph shows RED, it is recommended you supplement your herd with protein and/or energy to meet the requirements. Save yourself some money! At any time your graph shows GREEN, your livestock are meeting their daily requirements with the forage you are providing and are NOT in need of any additional supplementation. 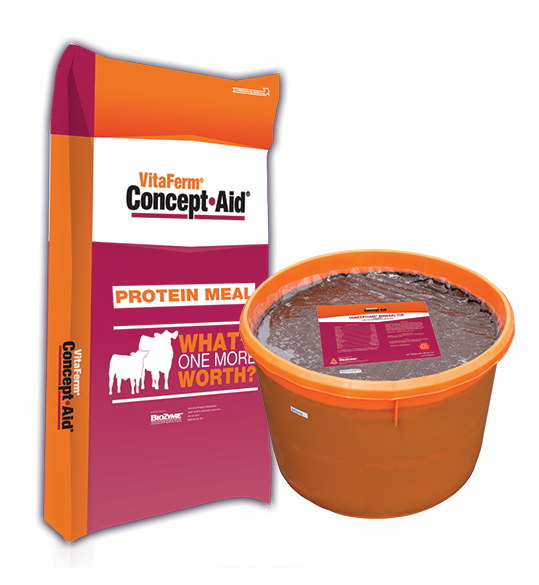 All VitaFerm Products contain 20% protein. A combination of Concept•Aid® breeding mineral and 20% natural protein in a meal or tub for beef cattle. Specifically designed for reproductive success when fed 60 days pre-calving through 60 days post-breeding. Especially beneficial in A.I. and E.T. breeding programs. Includes natural protein for when forage quality is low. 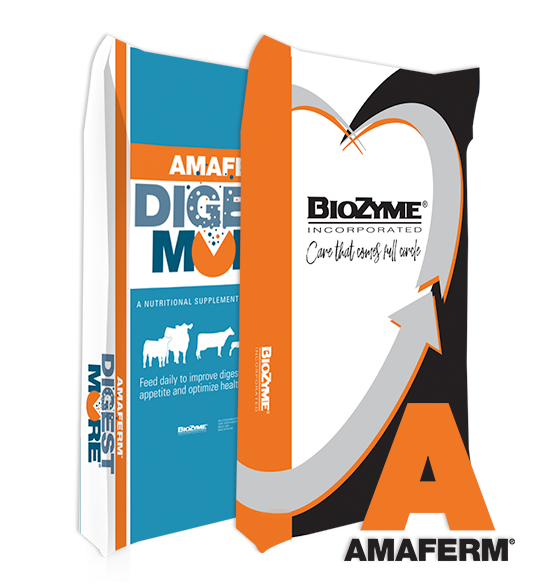 Amaferm® is a precision prebiotic designed to enhance digestibility by amplifying nutrient supply for maximum performance. Increased digestibility can increase performance parameters such as average daily gain and/or milk production. Amaferm, the key ingredient found in ALL VitaFerm products, increases energy by approximately 16%, each bag of VitaFerm provides enough energy to replace 200 lbs. of corn. 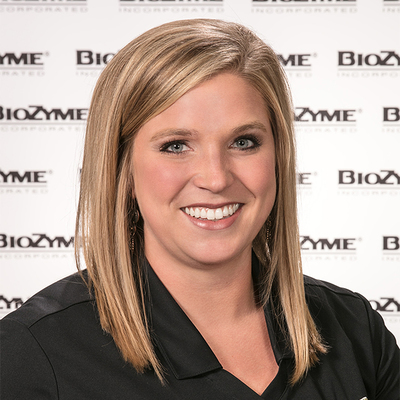 Once testing has been performed and we have a full understanding of the value of your hay, BioZyme’s team of nutritionists can provide complementary ration balancing to help develop a ration that works for you utilizing the resources you have available. For more information please contact Lindsey Grimes-Hall.